« A Shout out to My Peeps at Pride Today! Honey, it’s July and things are getting hot, hot, hot! 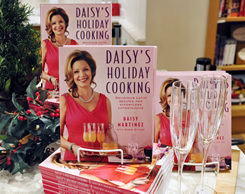 I am still reeling from the June we had around Casa Daisy this year, and the summer is just heating up. Speaking for myself, as much as I love to entertain during the warm weather, there is no way that I want to spend all day in the kitchen. Luckily, living in Brooklyn allows me the luxury of cooking and dining alfresco, while preparing healthy, fun, inventive salads that will make your family and friends pining for the recipe. Last month I was invited to the local CW 11 morning news to inaugurate their new studio kitchen, and I brought a few of these recipes with me (you can see the segment on my home page). In the spirit of happy and healthy summertime eating, I’m going to share another fave salad for July. My Jicama-Apple-Pepper Salad is pretty, tasty, satisfying salad that is perfect with anything and everything that you throw on your grill. What I’ll be throwing on my grill will be my Rosemary Scented Shrimp and Chorizo Pinchos which are incredibly easy, and just as delicious. 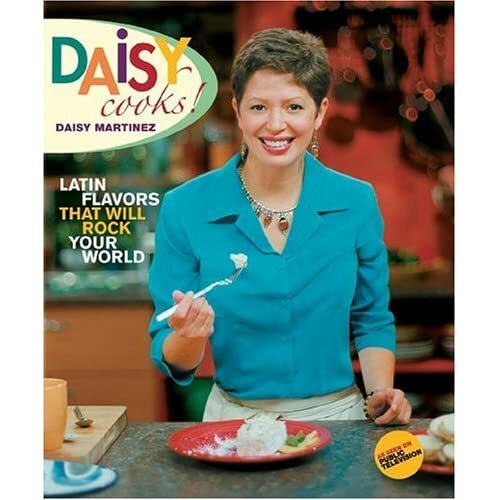 You’ll need a little something to wash those down with, so I’m giving you the recipe for my personal Daisytini, which was developed just for me by a good friend. I do the fruit thing in the summer, so set a nice ripe watermelon in the cooler and you have a delectable, refreshing dessert…no muss, no fuss! As I mentioned previously, June was quite a month! My own little Angela had her first professional thespian performance with the Subjective Theatre Company’s interpretation of TELL, directed by Jeffrey Whitted and written by Julia Hoffman. On the day that we all went to see the performance (Angela’s performance was videotaped), after seeing the show, we were approached by a lovely woman who came over to introduce herself as a casting director and express interest in working with Angela. Long story short, Angela is now working with a very reputable agency, and is going on auditions! I always said we’d all be working for that girl one day! You can see her and the rest of my “jamones” on Boriqua Blog in a movie that they all made as a gift for my birthday. I’m a very lucky mom! I also had the privilege of being involved with an event hosted by Selecciones en Español and The American Heart Association in Miami called Go Red De Corazon (www.goredcorazon.com) promoting heart health through diet and education for Latinos and Latinas. It was star studded event, filled with good food, good drink, and inspirational stories. A huge and hearty “thanks” to Genevieve Fernandez. Elaine Alimonte, and Patricia Beatty-Gonzalez for allowing me to be a part of such an uplifting project! With the obscenely high rates of heart disease in our community, it is an important message that this alliance has undertaken, and with some basic nutritional education and some good common sense I really believe that it will be warmly received. Kudos, ladies, and p’alante! And finally, I’m going to leave you all with wishes for a happy, healthy safe Fourth of July. As for myself, there’s a blueberry bush in my backyard that has “pie” written all over it! With Angie gone to sleep away camp, and the boys with their crazy schedules, it’s usually just Jerry and I for dinner, so it’s time to break out the rolodex, and start calling friends over!